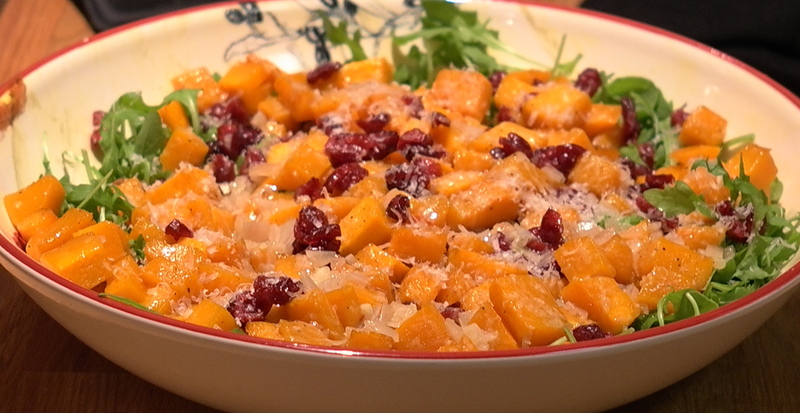 This beautiful Barefoot Contessa recipe is perfect for the holidays. If you are hosting vegetarians, this can serve as a satisfying main course as well. I put her exact recipe below, but I actually made a few slight changes. I used about 1/4 cup olive oil instead of 1/2 cup. Also, I forgot to put the cranberries in the oven, so I just added them raw. To toast the walnuts, I put them in a 350 degree oven for 8-10 minutes, tossing occasionally. Peeling a dicing a raw butternut squash is not on my list of favorite activities. However, super sharp knives help to do the trick. We recently got our knives sharpened by the good people at A Cook’s Companion. It was long overdue, and I am so glad we did it. It made the dicing process a whole lot easier.